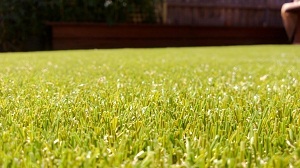 1/7/13 - What are the benefits of Synthetic Grass for me? Synthetic grass gives you back your freedom to enjoy life again. 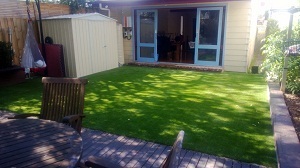 It doesn't matter if you call it fake grass, artificial lawn or even synthetic lawn, the results will be the same. Synthetic grass can be installed around your pool, as a feature around a rock garden or simply as your lawn, anywhere you need. Minimal maintenance (using a leaf blower or raking with a plastic rake once a week to get the leaves off) will see your synthetic lawn last for many years to come. Even pets aren't an issue, just clean up like you would normally do if it was natural grass. Imagine your weekends now filled with time for family and friends, going to sporting events, having 'barbies' or even just relaxing and doing nothing. The choice will be yours as there will no longer be the struggle with the lawn mower - we all know how hard they can be to start at times, the edging with a brush cutter and then raking and sweeping up the grass clippings. Not to mention the re-seeding, fertilising and aerating your lawn. Samples of the various types of grass are on show at Surrey Hills Garden Supplies in Canterbury Road, Surrey Hills, if you would like to see and feel it in person. 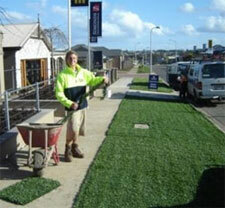 30/4/13 - How do I choose the right Synthetic Grass for me? Does the grass have a natural look and colour about it - you can get longer, slightly more uneven grass or a more manicured, shorter grass with brown blades throughout that makes it look more like natural lawn. The choice is entirely personal, but it is recommended to have a look at some grass already installed to see what it looks like on the ground. Are the installers experienced - it is advisable to ensure the installers you decide to go with are good at what they do. Ask for references and/or a list of properties they have done, be wary of those that will not give you that information. Is there a warranty - a trusted manufacturer will always back his products with a warranty, the better warranties are usually for 5-7 years. Will the grass withstand pets & children - the synthetic lawn needs to be soft under foot, yet strong and durable enough to last through years of your children and pets playing on it. 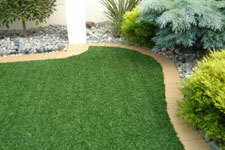 Generally, the longer the blade of grass, the softer the artificial grass will be. This information, hopefully, will assist you in making the choice a bit easier and give you a head start on what to look for. Synthetic grass can transform any area into a wonderful, magical kingdom for any child. Mark wanted to change his backyard from an area covered in brick and hard surfaces, to a lush, soft lawn for his daughter to run around on. His main problem - SHADE. Hawthorn, along with Glen Iris, Mont Albert and surrounding suburbs are known for having a lot of shady, tree covered back and front yards. This makes it near impossible for real grass to grow, which Mark had discovered. His solution was organising for artificial grass to be laid, knowing he would never have to worry about growing grass again. We covered the bricks: had some professionals (Surrey Hills Garden Supplies) do a great job. Jess just loves running around in bare feet. Yup, we would have liked real grass, but too much shade to get a decent lawn in winter. 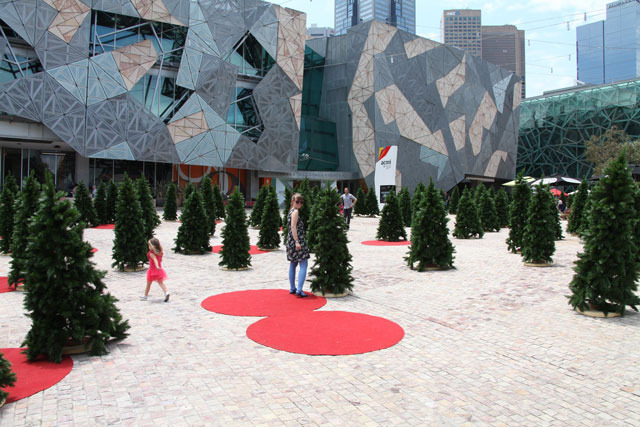 Once again this year, SmartGrass are thrilled to help Joseph Norster & his team from 'The Projects' create a Pine tree forest in the heart of Melbourne at Federation Square. Come along to see all the pine trees and synthetic lawn that changes the entire look of this iconic area in the city and take part in any of the activities they have on offer - such as join in one of the music nights, a picnic lunch on Christmas Day or have your photo taken amongst the trees. The owners of a building in Cotham Rd, Kew, avoided the usual routine of using paving or dull concrete on their balcony. Instead they opted for a SmartGrass synthetic grass finish to make the area more appealing and add more colour to what would have been a dull, grey area.